I recommend using the Tell ‘n’ ShowSM method for your slides. That means putting a slide title on each slide that tells the point and adding an image, diagram, chart, etc. to show the point. You DON’T put everything you say on the slide. 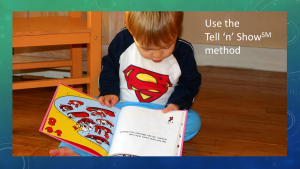 I’m not the slide police and I vary from this method sometimes, especially when doing technical training, but using the Tell ‘n’ ShowSM method will help your audience understand and remember more of what you say. When you don’t put everything you say on your slides, you have a handout problem. 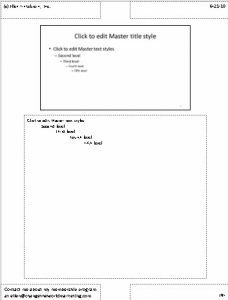 Many presenters want to offer handouts (usually after the presentation) but when the slides don’t include a lot of the content, the all-too-common solution of sending people the slides (printed or as a PDF) doesn’t work well. I believe that one of the best solutions is to use Notes pages. Notes pages are a configuration of each slide and the notes that you put in the Notes pane in Normal view. T he Notes pane is the pane below your slides. If you don’t see it, click NOTES at the bottom of the PowerPoint window to open the pane. 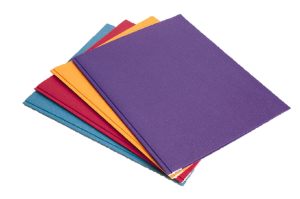 There are a few secrets to getting your Notes pages just the way you want them, which I explain below. If you don’t see the headers and footers in the Notes page display, you can add them. If you want headers and footers on your Notes pages, they MUST be on the Notes Master. Then, click Close Master View to return to Normal view. I know it’s rather roundabout, but you have to configure the existence of the headers and footers from within Notes Master view, but configure their content from Normal view. If you want the date, you can choose Update Automatically (always the current date) or Fixed (just enter the date you want). Check Page Number if you want page numbers. Check Header if you want one and type in the text. Check Footer if you want one and type in the text. You can move and resize the headers and footers. For example, you can move the headers to the bottom of the Notes page. You can also format the text–the font, font size, etc. Use the Home tab from within the Notes Master to access all the tools you usually find on the Home tab in Normal View. 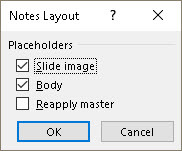 In the Notes Master, you can drag the slide image itself anywhere on the Notes page and resize it as well. Tip: If you will use the Notes Pages in PDF format, consider moving the slide to the edge of the page. You can move and resize the Notes box. To format the text, use the Home tab from within the Notes Master. You can add new content–any text or images you want. If you do, remember that it will be on every page of the Notes Pages. To make sure that your Notes Pages look right, exit the Notes Master and choose View, Notes Page. Here you can scroll through your presentation to check each page. Make sure they look the way you set them up. Warning: There’s a weird “gotcha” about Notes pages. If you change the Notes Master after you’ve created slides or if you have copied and pasted slides from another presentation, your notes pages may not take on the formatting you created in your Notes Master. Right-click on a blank area of the Notes page that doesn’t look the way it should and choose Notes Layout. 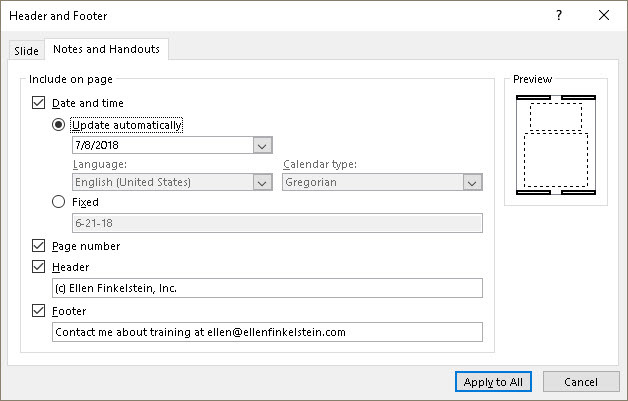 Check the Reapply Master checkbox. To the right of Full Page Slides, click the down arrow and choose Notes Pages. You’ll see the Notes Pages to the right and can again scroll through them to check that they are correctly formatted. If you chose to print to a PDF, the Save Print Output As dialog box will open so you can name the file and choose a location. Click Save to create the PDF file. 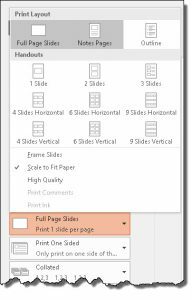 Note: While you can create a PDF of slides only by choosing File, Export (or Save & Send or Publish in earlier versions of PowerPoint), you can’t create a PDF of Notes Pages that way. You need to use the Print feature as I just described. How do you create handouts? Do you have any advice for successful handouts? Please leave a comment to share with other presenters. And if you found this helpful, please share on social media using the Share buttons so others can find this information.